Before something different, I think I will start with a schedule reminder. If your calendar looks anything like mine this week, a reminder might be a welcome thing. This Friday is the first official Last Friday of the season in Hillsborough, NC. That means that the Art Walk will be accompanied by music on the court house lawn, vendors, outside activities, and more. But, most importantly, this Last Friday is the opening reception for my featured artist show April Showers, Art Flowers. I hope to see you there Friday from 6-9! I titled my second sculptural bag “Lush.” This shoulder bag features bright blue butterflies and sunny yellow flowers. 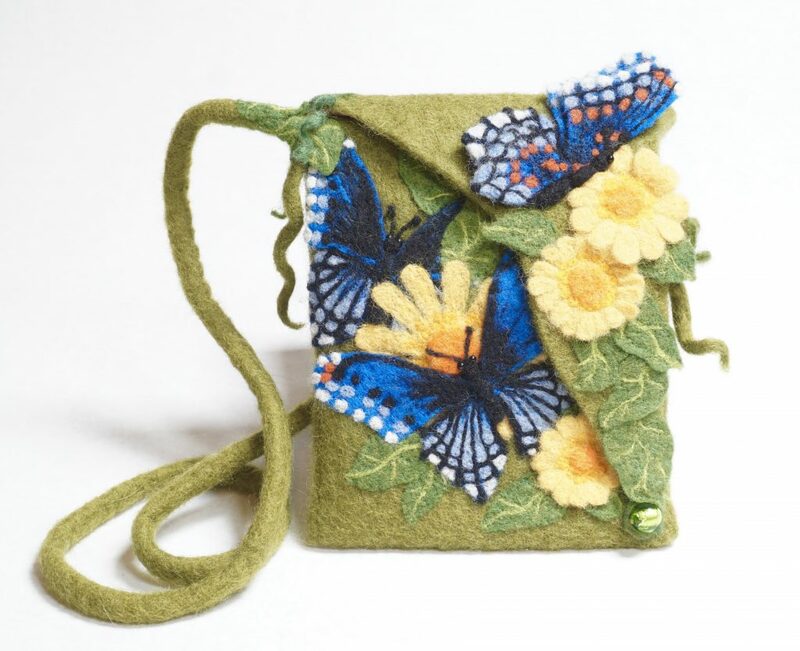 Tendrils and leaves complete this bag that looks as though it grew, rather than was made. Both bags have a large glass bead and loop as their closures, and hand sewn linings. I really enjoy the idea of creating items that will be a wearable pieces of art. If you have the chance stop in at HGA this Friday night from 6 to 9 pm. 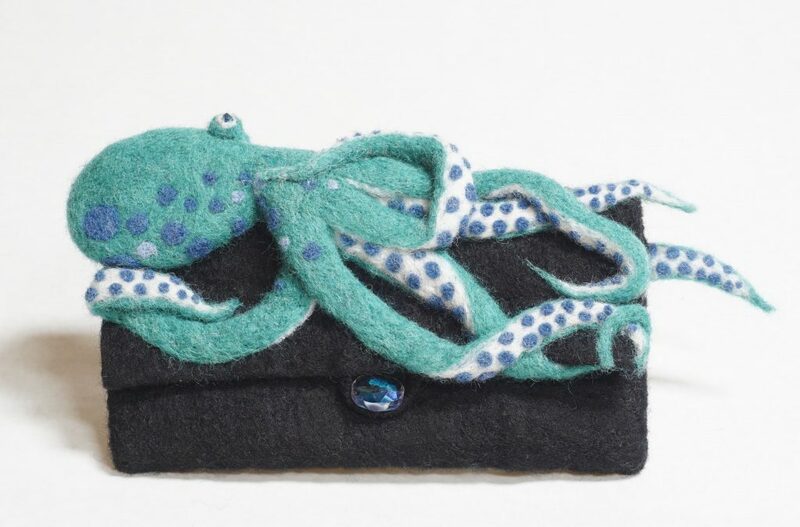 You can see these one-of-a-kind bags, my new sculptures and have the chance to say hello. 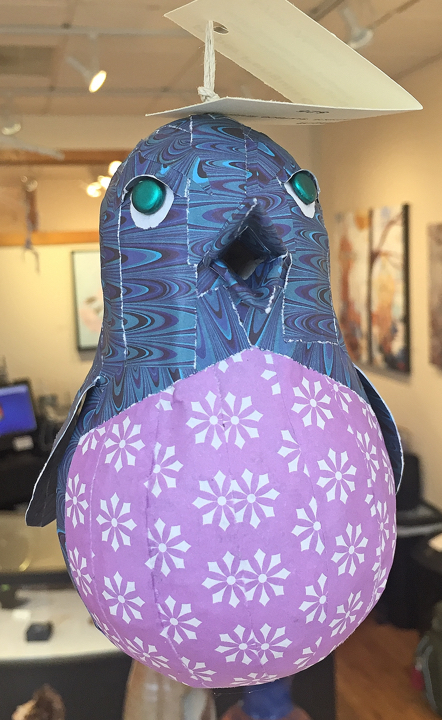 You can also check out the amazing new work By Chris Graebner, and Susan Hope. 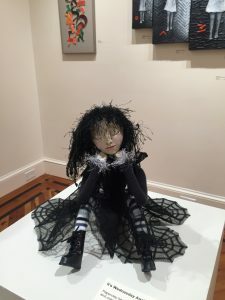 This entry was posted in Uncategorized and tagged art, art doll, Art show, Featured Artist Show, Hillsborough Gallery, needle felting, the Hillsborough Gallery of Arts on April 24, 2019 by lynnadmin. Create art that takes you out of your usual display space. This is the challenge we gave ourselves for the Hillsborough Gallery of Arts group themed show, “Other Dimensions”. 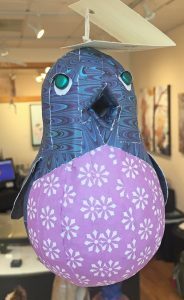 The initial idea was for 3D artists to create wall hanging art, and 2D artists make pedestal top pieces. However, each artist interprets the challenge in their own way. The results will go up on the walls and pedestals of HGA’s Featured Exhibit room this Thursday. Opening reception for Other Dimensions is this Friday, February 22nd from 6-9pm. 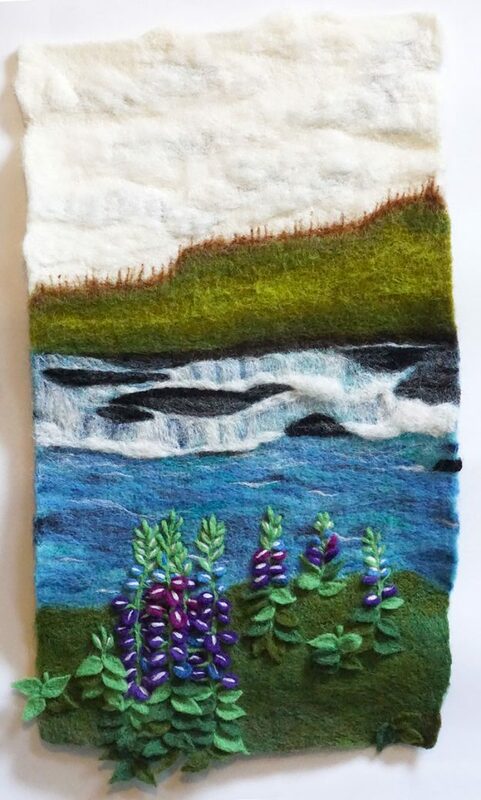 I took a “slice” out of a couple of photographs from our family’s recent trip to Iceland, and used them as the basis of needle felted hanging relief panels. The result of the first of these is “Travel Photo #1.” I took the original photo for this piece at the first of many waterfalls we encountered. There were several more dramatic falls along our itinerary route, but something about the moody sky and bright wild lupins in the foreground drew me in. The finished hanging is approximately 12″x 22″. My second “travel photo” is based on an photo by my talented student photographer daughter, Alexcina. Alex’s original image is of an Icelandic horse who appeared to be very aware of just how magnificent he looked with the wind blowing through his mane. 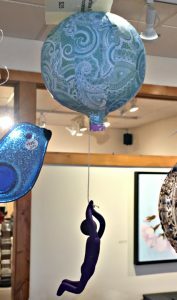 This diminutive hanging is approximately 5.5″x 10″. Both of the “travel photos” are muslin backed and wired for hanging, and you can see them at HGA starting this Thursday. 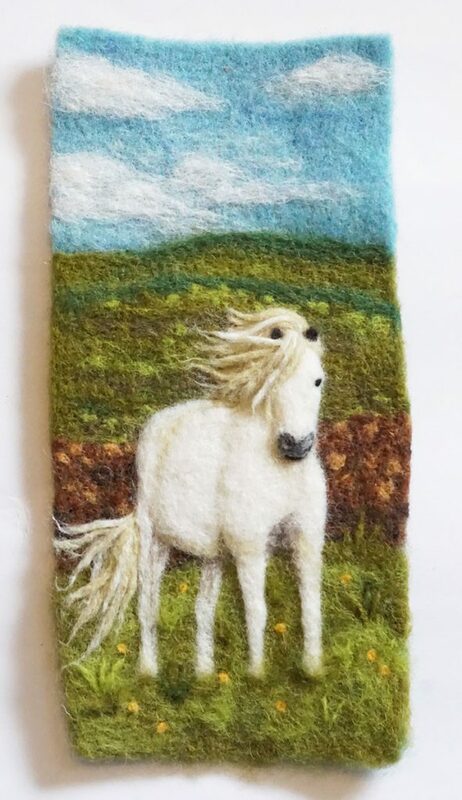 This entry was posted in Art Shows and tagged art, Art show, Hillsborough Gallery, Iceland, needle felting, travel photos, wall hanging on February 19, 2019 by lynnadmin. Travel and other summer distractions have kept me away from the work table somewhat the past few months. That doesn’t mean that my studio has been completely fallow, just a bit more relaxed. 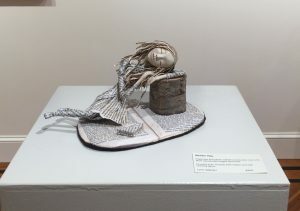 The last piece I delivered to the Hillsborough Gallery of Arts is Woven Dreams. 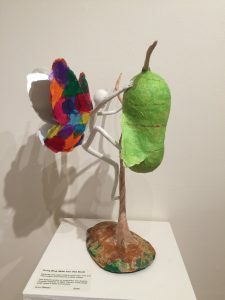 This piece is a papier-mâché and paperclay sculpture. I began with the crescent moon which I sculpted over a corrugated cardboard under structure. The moon contains an internal sandbag to keep it tilted at just the right angle to accommodate the seated figure. 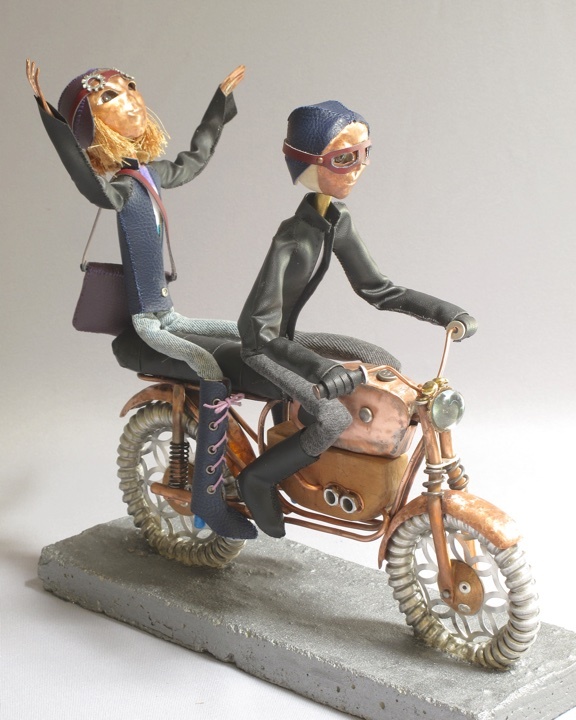 The dream weaver herself is paperclay and papier-mâché over a wire armature. I created her unique skin tone with strips of torn tissue paper, and a tiny bit of silver paint. Her “other worldly” eyes are fashioned from iridescent beads. The entire sculpture was then sealed before the addition of her silver tinsel hair, wire and beaded weaving, and glittering tulle skirt. I’ve also been busy finishing up sculpture commissioned as a present. I will share a few images of after she is delivered to her new home. Back to the work table. 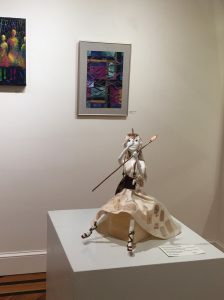 This entry was posted in Art Dolls and tagged art, figure, figure sculpture, Hillsborough Gallery, mixed media, sculpture on August 10, 2018 by lynnadmin. 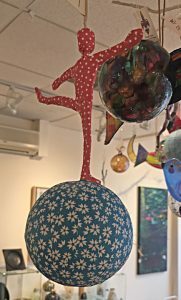 Monday I added some new hand crafted holiday ornament designs to the selection at the Hillsborough Gallery of Arts. Each November, we install our holiday show titled, “The Art of Giving”, when the preview show for the open studio tour comes down. I always add two or three types of original hand crafted ornaments to what I bring in. For several years now, I have created copper and pierced aluminum stars and hearts, and some small snow fairy figures. 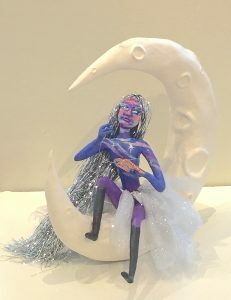 Recently, I have found myself drawn to working more and more paper and text into the creation of my art doll figure sculptures, so I decided to create some new papier-mâché holiday ornaments this year. My balloon rider ornaments are a design I came up with last year. I updated them this year and used polymer clay for the little figure sculpture. Last year I modeled the tiny balloon rider out of paperclay, but that required a wire form inside the clay figure. The polymer clay allows me to be a bit more efficient with my time. The balloon construction is the same as the penguin body. The Ball Dancer is my third ornament design this year. It starts with a ball I create over a balloon like the other two ornaments. 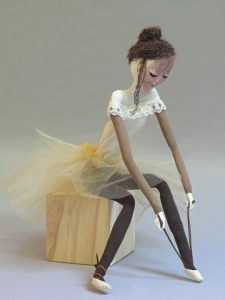 I sculpt a small dancing figure out of recycled corrugated cardboard or scraps from my studio foam core stash. Strips of origami and scrapbooking paper complete the surface. 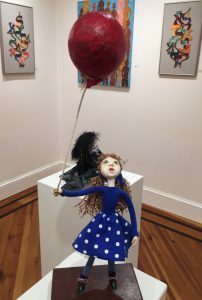 My ornaments, art doll figure sculptures, jewelry, and the beautiful work by all 22 of the Hillsborough Gallery of Arts owner/artists will be on display and available for one of a kind gift giving now through New Year’s. Join us on Friday, November 24th for the holiday show’s opening reception from 6-9pm for some decidedly non-stressed “Black Friday” holiday shopping. 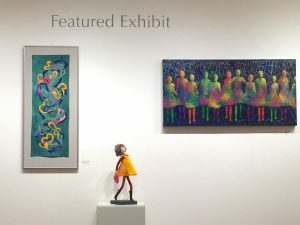 This entry was posted in Art Shows and tagged art, figure, figure sculpture, Hillsborough Gallery, holiday ornament, holiday ornaments, mixed media, one of a kind, sculpture, the Hillsborough Gallery of Arts on November 18, 2017 by lynnadmin. Chilly winter weather can sometimes serve to inspire new works. I created a piece titled “Snow Day” on a snowy day when I wanted to use mostly materials from my indoor workspace. My latest, “Questioning Alice”, isn’t directly the result of cold weather nudging me indoors, however I was inspired by the idea of curling up with a good book on a cold day. I created an earlier art doll sculpture titled “Paper Alice” a couple of years ago. 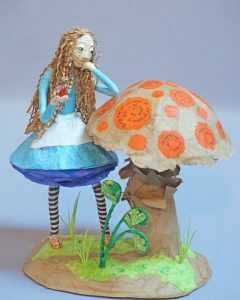 Though not completely a paper creation, I incorporated elements pulled from Adventures in Wonderland in her design. This time I wanted to work as much with paper and paperclay as possible. 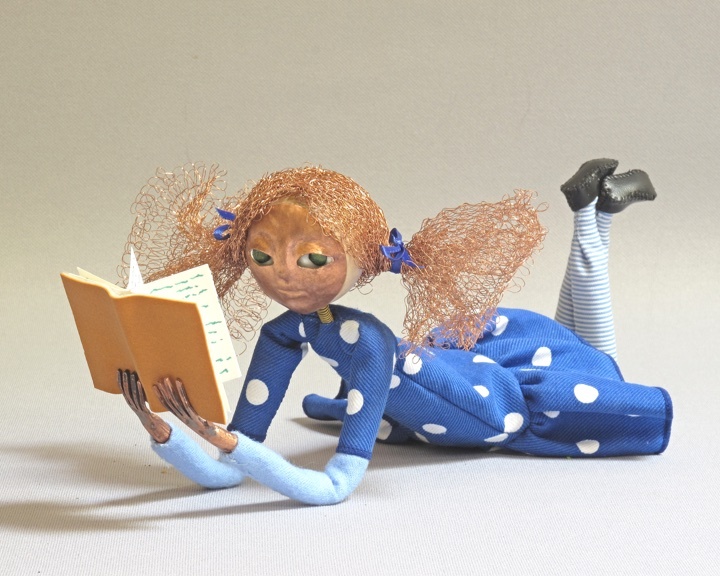 I’ve found myself enchanted by altered book sculptures, and wanted to create an art doll that had that feel to it. Anyone who has read the tales of Alice’s adventures may have noticed that the stories contain a lot of inquiries and decisions to be made. 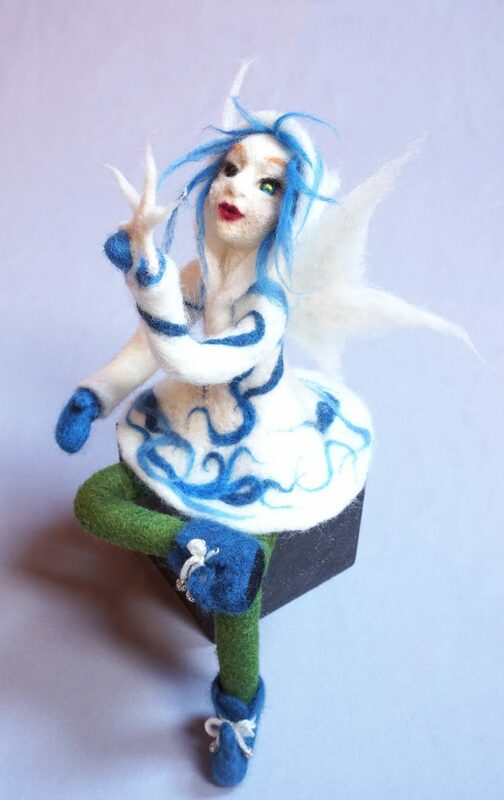 Playing with that concept, I created this art doll sculpture. I created my Alice primarily of paper mâché, paperclay, and tissue paper decoupage. I sculpted the main figure over a wire armature. The mushroom I formed over heavy cardboard rolls, and a corrugated support under the top. Alice’s clothes I created through tissue paper layering and tissue paper decoupage. I added printed images of the classic Sir John Tenniel illustrations within the skirt’s top layers. Text from the tales “tattoo” her paperclay sculpted face. Questions asked to and by Alice were fit to spiral paths and then printed on to orange tissue paper. Layered within more orange tissue these form the mushrooms “questioning spots”. 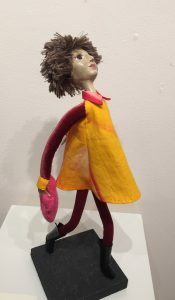 This Alice will be showing up at the Hillsborough Gallery of Arts the last week of January for, “Now and Again”, the Gallery’s 10th anniversary celebration show. The show will celebrate the milestone and will include HGA’s current and former members. 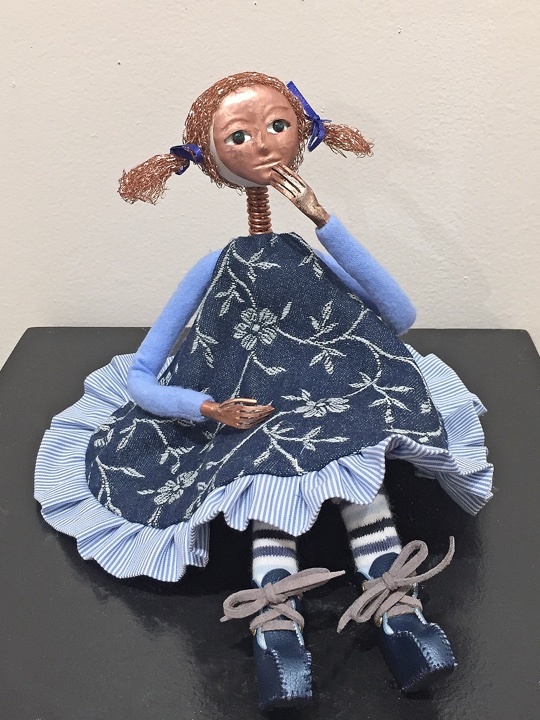 This entry was posted in Art Dolls, Art Shows and tagged Alice, Alice in Wonderland, art, art doll, figure, figure sculpture, Hillsborough Gallery, mixed media, one of a kind, OOAK, the Hillsborough Gallery of Arts on January 9, 2017 by lynnadmin. Perhaps a few days late, but as promised, here is a completed image of the Lacing III art doll that I showed in progress last week. I’m not sure that the title will stay exactly the same. 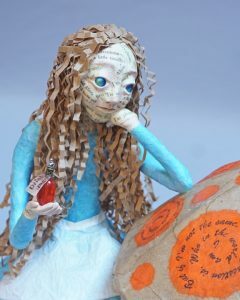 This art doll will most likely remain in the studio as part of inventory build up for my gallery show in September. Available sculpture in the gallery will have a part to play in that decision making process. The piece I shared two weeks ago, Cello, will definitely wait until that show, as I chose her image as my early publicity piece for that show. Lacing III is similar to Cello in scale as well. I have been increasing the size of my art dolls slightly. I find that it is easier to focus more on details of the figure’s features with a bit more room to work with. Taking a step back however, I notice that I have increased the head and face much more than the proportions of the rest of the body. This does give an interesting stylistic look, but I’m not sure I’m quite where I want to be. I spent quite a bit of time soft sculpting Lacing III’s body, but she still looks thinner than I want her to be, and her hands and feet need to be increased as well. I’m obviously not going for any form of hyper realistic rendering with these figures, but I want to avoid them falling into the realm of caricature. I guess the next art doll sculpture will offer ample opportunity to address those design challenges. Each work teaches me something new for its successor. It is interesting to go back and look at the evolution. This not only illustrates change, but highlights some interesting past design choices that I may have forgotten. I just had such an opportunity prior to starting to write this post. 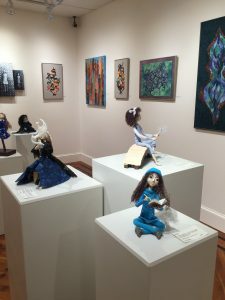 I was adding images to the gallery available for insertion into my posts, and updating the Art Dolls page of this site. If you have not visited that page. I have most of the art doll figures I have made in the gallery there with prices listed for those that are still available for purchase. I try my best to keep all those available toward the beginning so that you do not have to scroll through them all unless you want to. I’m off to put in an order for the Professional Doll Makers Art Guild coffee table book. It is only available to members at this time, but I will share a link in the future if you are interested. In the mean time, the link above will take you to my page on their web site. 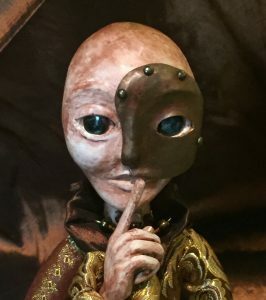 This entry was posted in Art Dolls and tagged art, art doll, dancer, figure, figure sculpture, mixed media, one of a kind, sculpture, steampunk on June 27, 2016 by lynnadmin. I took two of my newest pieces to work with me at the Hillsborough Gallery of Arts today. In between welcoming visitors, and discussing the art, I can sometimes get little projects, like writing a blog post, done. 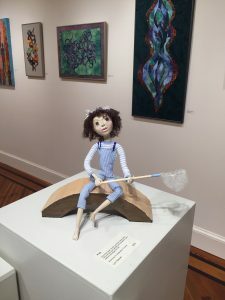 As I usually have several art dolls in various stages of completion on my work table, I decided to take two into the gallery with me so that I could share them with you. I still have a stand to paint for one, and to decide on the second’s title, so phone snap shots will have to serve for the time being. 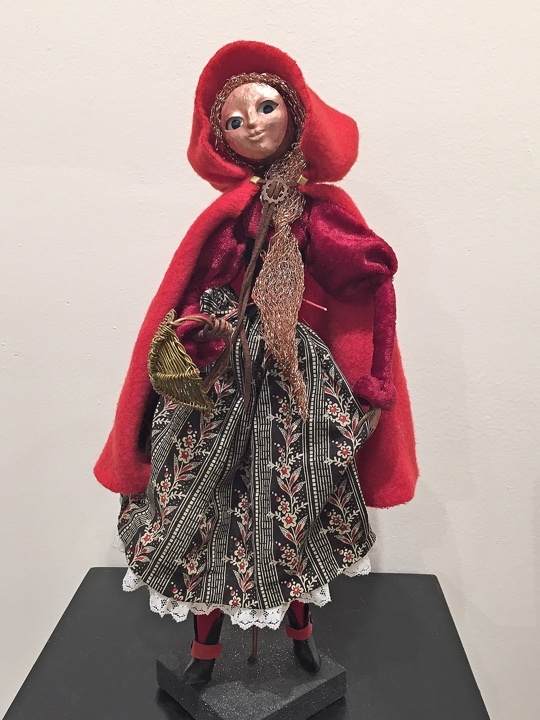 The next addition to my series of fairytale dolls, is my interpretation of Red Riding Hood. My Red has a hammered copper face and hands, and torch fired enamel eyes. Her hand sewn clothing also features a lace up bodice. I’ll need to remember to move her hair a bit when I take my studio photos, so you can actually see it. I think her basket also needs a fabric liner and top to finish it off. You will see Red again once I get her on her own stand. This second figure is officially unnamed at this time. She is a youthful seated figure in a little smock dress similar to an earlier art doll named Lily. Her expression emerged wide eyed and thoughtful. I saw her as carefully considering some choice or problem. My two “first viewers” at home thought that she appeared to be a bit worried that she had done something wrong. I’m not completely sure about that interpretation, so for right now I’m going with her having made just a small misstep, and so I have named her Oops. Oops, Red, and several other art dolls and sculptures will be installed in a show later this moth. More on that to come. This entry was posted in Art Dolls and tagged art, art doll, fairytale, figure, figure sculpture, Hillsborough Gallery, mixed media, one of a kind, OOAK, sculpture on October 6, 2015 by lynnadmin.